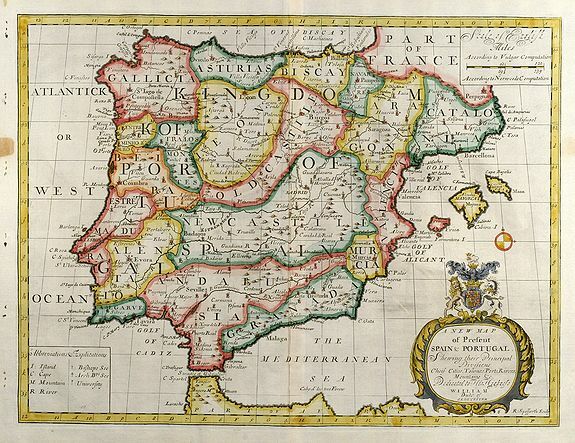 A New Map of Present Spain & Portugal - WELLS, E.
Title : A New Map of Present Spain & Portugal. Map maker : WELLS, E.. Size : 14.6 x 19.3 inches. / 37.0 x 49.0 cm. Description :Decorative coloured map of Spain and Portugal with parts of France, the northern part of Africa and the Balearic Islands. Condition : Several holes and a brown spot in left margin, two vertical folds flatted, manuscript page number by old hand in upper right margin. Overall good condition.